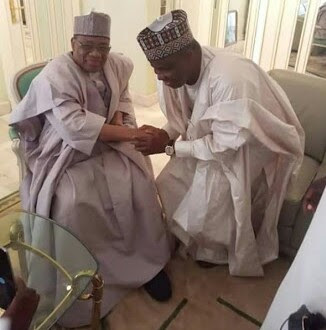 Former President Ibrahim Babangida has praised Sokoto state governor and leading presidential aspirant of the PDP, Aminu Waziri Tambuhwal as a “grounded leader”, who has the requisite experience and capacity to take Nigeria to the next level. A statement by Tambuwal media office said Babangida spoke when the Sokoto state governor paid him a visit in his Mina, Niger state, hill top mansion, as part of the consultations over his current presidential ambition in the forthcoming 2019 general election. IBB, who said he wished the former speaker House of Representatives, well on his ambition assured him of his blessings, adding that he has started well “setting up a strong and formidable team, which is the hallmark of good leadership”. Tambuwal had in his speech told the Mina General that he had come to formally inform him of his presidential ambition and to also “seek his blessings”. The former speaker said that Nigeria has never been this polarized along ethnic and religious differences. He said, “We must take back our country, reunite our people and reposition the nation for it to be properly restructured for the benefit of all Nigerians .We need to secure Nigeria. This Country has never been this divided and has never been this enmeshed in confusion and security challenges.